Having made nero pasta for the first time ever I knew I had to make a sauce that would stand out – and this one for Pasta With Meatballs really did! 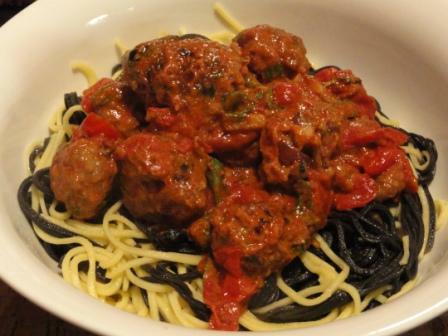 Nero pasta, or black pasta, is made with squid ink. This is not readily available in South Africa. I found some in a small supermarket when we were in Sienna. Result: For 2 people and a few left over meat balls! add the pasta, serve and enjoy!